Daisy Lopez is the Denair High School Class of 2018 valedictorian thanks to her 4.16 grade-point average. The salutatorian will be Hannah Knox, who compiled a 4.11 GPA in her four years. Both young women aspire to become veterinarians. 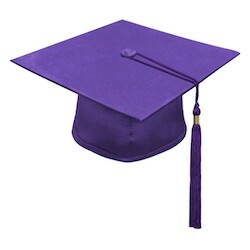 The graduation ceremony will be Friday, May 25 beginning at 7:30 p.m. at Jack Lytton Stadium. Gates open at 6 p.m. Tickets are not required. After students receive their diplomas, there will be a Sober Grad Night party in the gym. Lopez and Knox recently took time to answer 10 questions about their high school experiences. Question: What are the key things other students should know about your academic success and how you achieved it? Lopez: Keeping myself motivated and aware of the goals I wanted to achieve helped me continue working hard throughout my academic years at Denair High School. Also, enrolling in honors and AP classes really helped expose me to new and challenging material. Knox:Always try to push yourself, but know your breaking point. I pushed myself too hard and it ended up backfiring for me. Also, good grades just don’t happen for most, so if you want a good grade, you have to go that extra mile in every assignment and every test. It’s always better to do more. I made this my philosophy when I came into high school and it really prepared me for honors and AP classes. Q: How much time outside of class did you spend studying or doing homework? Knox: I have never been a big studier, so I learned to cram right before a test, such as the night before or literally minutes before a test, which seemed to work pretty well for me. Maybe I’ll take a night off once in a while if I know I have time before the assignment is due. Lopez: Outside of class, I spend about three to four hours every day doing school work. The 70 graduates of the Denair High School Class of 2017 received their diplomas Friday night in front of friends, family and community members at Jack Lytton Stadium. The ceremony featured remarks by Superintendent Aaron Rosander, Principal Kara Backman, valedictorian Hector Obando and salutatorian Libby Martinez. School board members were on hand to present diplomas to the students. Thank you for joining us at Jack W. Lytton stadium for Denair High’s very own graduating class of 2017. It comes with great respect and privilege to be here today. Watching all of the people I have grown up with become young adults has gone by too fast. We are on the verge of adulthood! But first, to become an adult we have to strive towards goals our role models have set for us. Therefore we should congratulate not only ourselves, but our role models which includes parents, teachers, coaches, guardians, extended family, friends and anyone else who has imprinted on our lives. As we become adults, we too are going to be role models. Now, I am not saying to act perfect because nobody can ask that. Just remember, as you continue your trail of life, do not go unnoticed. There’s always someone watching whether they are older or younger than you are, and it is never wrong to make a difference in their life. 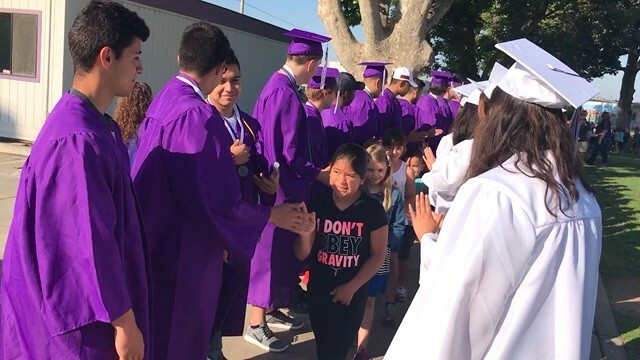 The Denair High School Class of 2017 provided real-life inspiration to their much younger peers Thursday morning, donning their purple and white caps and gowns and marching through the Denair Elementary Charter Academy campus. It was the first step in a daylong series of events, including a mid-morning graduation practice walkthrough, leading up to Friday night’s commencement ceremony. Graduation begins at 7:30 p.m. at Jack Lytton Stadium. Thursday’s first-ever Grad Walk was the brainchild of high school Principal Kara Backman and Amanda Silva, the district’s assistant director of special education. It was patterned after similar events discussed at a No Excuses University conference in January, Silva said. NEU is an educational model built around the belief that every child has a right to be prepared for college, starting at the elementary level. Denair schools have embraced that philosophy and are working toward NEU certification. Beneath their robes Thursday morning, Class of 2017 students wore T-shirts from their colleges of choice. Backman said 47 of the 70 graduates plan to attend a college or trade school of some kind. Hector Obando is the Denair High School Class of 2017 valedictorian by virtue of his 4.17 grade-point average. The salutatorian will be Elisabeth “Libby” Martinez, who compiled a 4.15 GPA in her four years. The graduation ceremony will be May 26 beginning at 7:30 p.m. at Jack Lytton Stadium. Gates open at 6 p.m. Tickets are not required. Obando and Martinez recently took time to answer 10 questions about their high school experiences. Obando: Other students should know that hard work is universal. Anyone can push themselves to their limit and succeed. Perseverance is also something that helped my academic achievement. Martinez: My academic success is from my perseverance and determination. I may have procrastinated to get things done, but at the end of the day, I knew I would have to do them, so why worry about them later? Martinez: Outside of class, I would spend about an hour every day doing homework or trying to study. Obando: I spend approximately an hour or more, if needed, studying and doing homework. Q: Which classes and/or teachers at Denair High had the most influence on you? Obando: All my teachers have really inspired me throughout my four years, including but not limited to Mr. Wagner, Mr. Cumberland, Mrs. Hilton, Mr. Allen, Mr. Stav and Sra. Olivas. In each of their courses that they taught me, I have learned many valuable lessons for the next step in life. 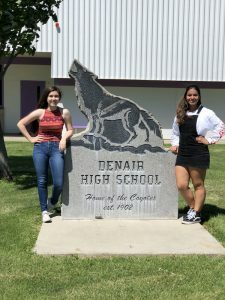 Denair High School long has been a leader among all Stanislaus County campuses when it comes to graduating its students. That trend continued with the Class of 2016. Denair compiled a 97.1% graduation rate – 66 of its 68 seniors earned a diploma last spring. That compares with an 83.8% rate among all schools in Stanislaus County and 83.2% in California. 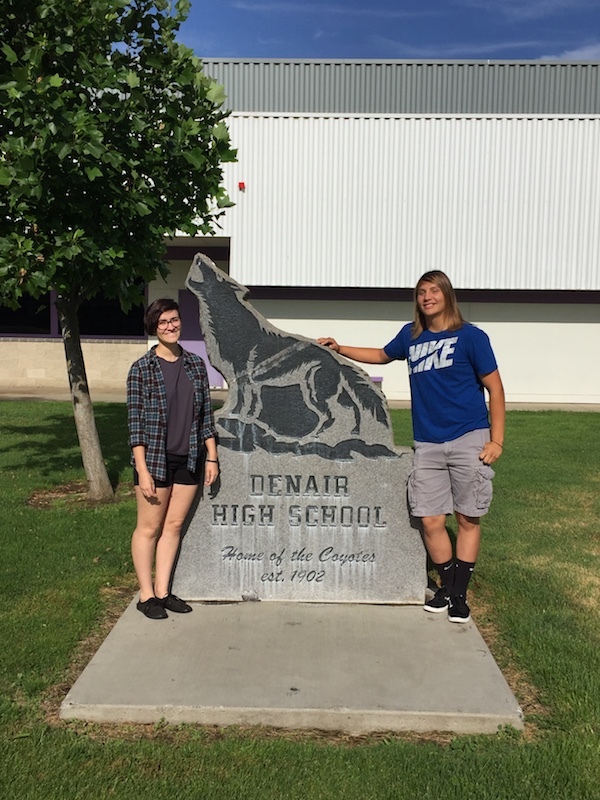 In the past seven years, graduation rates at Denair High have been as high as 100% (2010-11) and never lower than 93.7% (2013-14). By comparison, Stanislaus has fluctuated between 74.9% and 84.6% while the state was as low as 74.7% as recently as 2010-11. Many of Denair’s graduates attended public and private universities in California, while others have been accepted at prestigious colleges out of state. College attendance is emphasized and encouraged at all grade levels, there are college application workshops, presentations from schools from the UC and CSU systems, and Denair High School’s counselor works with students and their families on enrollment, grant and scholarship applications.